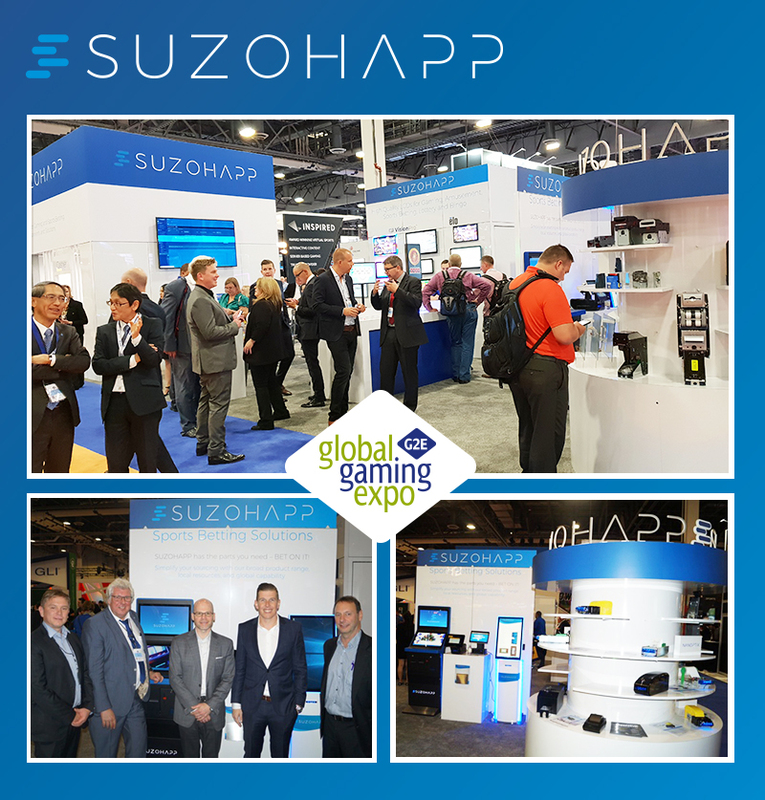 MOUNT PROSPECT, November 9, 2018 - SUZOHAPP - a leading software and hardware supplier of complete cash management solutions, with over 50,000 gaming, amusement, sports betting, lottery and bingo products for casino operators and Gaming OEMs - was well received at the 2019 Global Gaming Expo in Las Vegas, Nevada. SUZOHAPP's booth featured three themes for its visitors: sports betting components and partnerships, OEM casino components, and the cash handling components and solutions for the cashier cage and back office. "This year's G2E was an excellent presentation of who we are," says Sim Bielak, SUZOHAPP Chief Marketing Officer. "Simplify your sourcing was the message we wanted to get across, and we carefully brought together at the show our cash management strategy, comprehensive components portfolio and solution-building identity, proving we're a viable partner in the sports betting space." SUZOHAPP is the only global company providing a comprehensive offering of components for casino and sports betting OEMs. This includes but is not limited to LCD monitors featuring top quality brands such as Elo Touch Solutions, Wells Gardner, Ceronix, and SUZOHAPP's very own VisionPro�, in addition to touchscreens, bill validators, printers, coin mechanisms, LCD button decks, push buttons, barcode scanners, locks, toppers, USB chargers, power supply, and more. "Many long time-customers from around the world, as well as new companies who visited our booth, were astonished at discovering that we offered so many components," says Mike Sigona, SUZOHAPP Global Gaming Product Manager and Business Development Manager, Europe. "Within one meeting they saw how we could simplify their sourcing by providing product and technology updates on such a wide range of products, as well as answering detailed questions. Additionally, SUZOHAPP further demonstrated its bandwidth as the ideal supplier of complete cash handling solutions for the players, the casino cages, as well as for back-office counting/sorting requirements. The SUZOHAPP CashComplete� brand coupled with the CashComplete� Connect software showcases SUZOHAPP's advanced cash automation technology. "The engineering innovation we showcased in the private room was an absolute hit," says Nathan Paredes, SUZOHAPP Sr. Director, Solution Sales, Americas. "We had the largest players in EGM space coming back several times to show their colleagues the technology. Given our core market and cash management strategy, along with the positive feedback we received this year tells us two things: we can't overlook how intertwined gaming, retail, and hospitality industries are, and that there is value in being able to continue to utilize G2E as a platform for engaging with other likeminded technology partners." Solution products on display of key interest were the SCAN COIN ICX Active-9 Coin Sorter, the CashComplete� SDS-35 Smart Deposit Solution and the CashComplete� RCS100, RCS-600 & RCS-700 Recycling Cash Systems. Furthermore, at G2E SUZOHAPP announced its new partnerships with Everi Payment Inc. and Digitote. The partnership with Everi should accelerate and advance cash management and automation within the gaming industry while partnering with Digitote helps SUZOHAPP develop customized sports wagering software applications that will provide a scalable, flexible hardware and software offering to the quickly emerging U.S. sports betting industry and the larger international customer base. "Globally, gaming accounts for a significant share of SUZOHAPP's turnover," says Goran Sovilj, SUZOHAPP Executive Vice President Gaming & Amusement, Europe. "I believe G2E is important because all key OEM customers attend, including all decision makers, and is, along with the ICE in London, the most important gaming show." SUZOHAPP is a technology company providing software and hardware for cash handling automation and self-service solutions to more than 25,000 customers throughout the world. SUZOHAPP's technology enables automation for customers operating in a variety of end markets, including retail, transportation, gaming, banking, vending and amusement. SUZOHAPP's solutions include cash deposit, recycling, processing and payment systems as well as a broad range of self-service component technologies. The brands of SCAN COIN, Comestero, CashCompleteTM and Coinco are united under the SUZOHAPP Company. SUZOHAPP's more than 1,100 employees operate in 19 countries and its dealer network covers more than 100 countries. More information is available at www.suzohapp.com. SUZOHAPP is owned by affiliates of ACON Investments, L.L.C., a Washington, D.C.- based international private equity investment firm that has responsibility for managing approximately $5.5 billion of capital. For more information, visit www.aconinvestments.com. Global Gaming Expo (G2E), presented by the American Gaming Association (AGA) and organized by Reed Exhibitions, is the largest gathering of global, commercial and tribal gaming professionals in North America. The event showcases the latest developments in gaming technology and features new educational content that is fast-paced and actionable. Attendees will experience firsthand the new products and innovative technologies showcased on the expo floor. G2E has everything you need for your casino floor and across your entire operation - from traditional casino fare to non-gaming amenities and digital products - G2E is where business growth is accelerated. The American Gaming Association is the premier national trade group representing the $261 billion U.S. casino industry, which supports 1.8 million jobs in 40 states. AGA members include commercial and tribal casino operators, suppliers and other entities affiliated with the gaming industry. It is the mission of the AGA to achieve sound policies and regulations consistent with casino gaming's modern appeal and vast economic contributions.